Last night I gave the keynote presentation at the Trader’s Expo at the Marriot Marquis in Times Square. 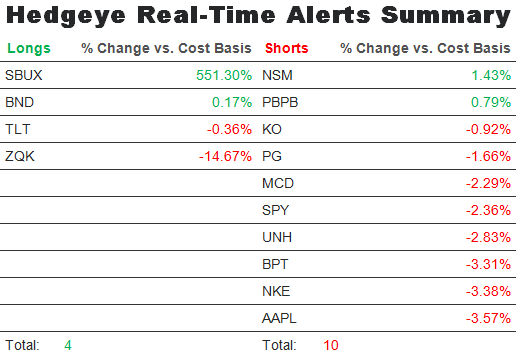 Prior to giving the speech, I walked around the conference floor and heard a lot of stories of trading systems that would generate ten bagger returns, some that had triple digit positive performance last year, and so on. Clearly, the exhibitors needed to grab people’s attention in order to engage in a sales discussion. Frankly, compared to some of the presentations, I’m guessing my presentation on the U.S. economy was a tad boring. In my presentation, I gave a quick update on our Q1 Themes and the view that economic growth in the U.S. may be slower than consensus expectations in 2014. Rightfully so, my prognostication, if you want to call it that, raised some questions. 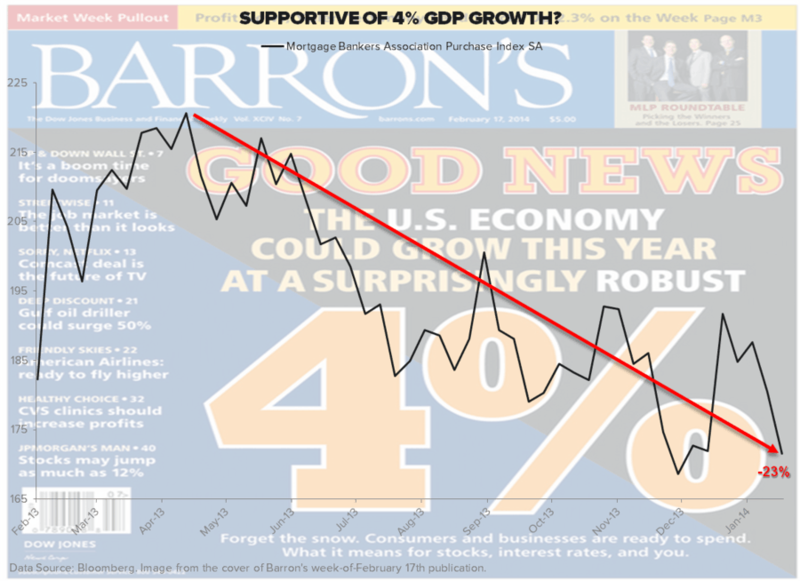 The first question related to the cover of Barron’s this weekend which heralded the potential return of 4% growth in an article titled, “Why the Economy Could Grow by 4%”. The article was, in effect, an interview with a group called Applied Global Macro Research (AGMR), and to be fair they sounded like thoughtful guys, who are clearly an outlier with a 4% growth projection for the U.S. economy. The question poised to me related to how the Hedgeye view differed from the view on the cover of Barron’s. My response was simple: housing. The economists from AGMR expect housing to be a massive tailwind. In the long run, we get their thesis, but in the short run we see headwinds to housing and this more tepid view on the U.S. economy may, sadly, keep us off the cover of Barron’s this year. Back to the Global Macro Grind . . . Qualified Mortgages - The new “QM” (Qualified Mortgage) rules that went into effect in January tighten standards and increase culpability for both lenders and servicers. Tighter lending standards will be a drag on aggregate housing activity on the margin – particularly for 1st time home buyers and others with irregular incomes. First time home buyers are ~35% of the market. In the long run, the housing recovery likely does have legs given the nature of the massive over build and then years of inventory drawdown, but in the short run the headwinds noted above will be important to monitor. The caveat to any view of housing, either negative or positive, is that interest rates will be the biggest driver and if interest rates head meaningfully lower from here (hard to believe that will happen if the taper is in) then our cautious view on housing would likely become more positive. Speaking of becoming more positive, and I’m not saying we are just yet, but Merrill’s Global Fund Manager Survey came out this weekend and had some interesting contrarian data points. First, cash levels have risen from 4.5% to 4.8%, the highest since July 2012. Second, emerging markets and global energy allocations are at record lows, while global bank allocations are at record highs. Finally, global staples allocations are at the lowest levels since September 2003 (ahead of CAGNY). It is difficult to put too much credence in a set of data we didn’t create or collect ourselves, but it is certainly worth noting the extremes in the Merrill survey. Much easier to discern is the market based indicators of inflation, which continue to percolate. An extreme example of commodity based inflation domestically is natural gas, which is up almost 30% for the year-to-date. Less extreme is the pervasive use of natural gas in the domestic U.S. economy. According to the Energy Information Administration, there is almost 25 million MMcf used domestically on an annual basis. If my math is correct that is an almost ~$125 billion input cost into the U.S. economy every year, which is split broadly between heating, residential use and industrial use. The bottom line is that if one of the key commodity input costs into the U.S. economy is up almost 30% in the year-to-date that, my friends, is inflationary. Although perhaps not quite as bad to the economy, even worse is that a coffee addict like myself has to endure Arabica coffee bean prices up 10% this morning!